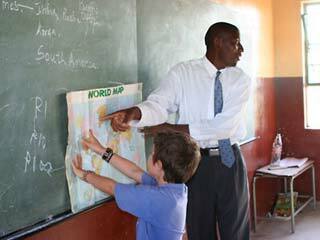 Learning vacations - hands-on educational trips - are one of the biggest trends in family travel. And parents aren't waiting until the tikes turn teens to introduce the kids to foreign cultures and inspiring activities. Adventure travel enthusiasts are watching wildlife with kids in Costa Rica and trekking with children in Bhutan. Cultural travel aficionados are experiencing Tuscany with toddlers and digging for dinosaurs with school-aged children in the North American badlands. When on a trip to Kenya my then 7-year-old daughter learned how to fish with nothing but a hook and line, the educational value of family travel hit home. Family vacations can give kids a broader understanding of the world and a greater appreciation of their home and family. The key is to find the right balance between education and fun and allow the learning to happen naturally. Select a trip that is of interest to all members of the family and be sure that the experience is appropriate for your child's age. While a dinosaur dig is likely to attract the interest of budding paleontologists, a dig for a day program may be sufficient for preschoolers. A multi-day expedition that resembles a family camp and includes fun extras such as rafting and work in a paleontology lab may be of interest to a primary school child with a penchant for the outdoors. Participation in a lengthy research trip that consumes the entire family vacation could try the patience of everyone. Expose the kids to the destination or activity before you depart. Learning vacations are an opportunity to reinforce a child's curriculum as well as an opportunity to introduce the kids to something new. True-life stories, even novels set at your travel destination, are a great way to introduce tots to a new adventure and get teens and tweens ready for a family trip. But you may need to do more. Sampling an activity in advance could avoid an unpleasant surprise on holiday. After a bike trip along a local canal we determined that our 8-year old daughter was not yet ready for a cycling vacation in France or elsewhere. Manage your expectations. As parents, we may secretly hope that our children return from an educational trip to the Galapagos as skilled ecologists. Yet the experience may only set the foundation. Observing wildlife may not yield a discourse on Charles Darwin, the British naturalist, but will likely help children grasp the concept of endangered species. Leaving behind a shell collection for other children to see may not qualify as environmental activism but it is the first step in ecological awareness. Learning doesn't need to be structured to create knowledge and understanding. Interaction with local children goes beyond making new friends; it provides kids with direct exposure to foreign language, culture, and customs. And it will add meaning to your trip in a way that an art museum or rafting trip cannot. Organized family learning vacations from arctic adventures to wildlife safaris are offered by travel specialists in just about every corner of the world. Yet you need not mortgage the family home for your family vacation to be enriching and educational. A do-it-yourself family field trip is possible whether you travel to a major city, camp in a national park or head to grandmas for the weekend and they can be just as rewarding and fun.